Since the US-ledinvasion and occupation of Iraq in 2003, the challenges of sectarianism and militarism have weighed heavily on Iraqi women. In this book, Zahra Ali foregrounds a wide-range of interviews with a variety of women involved in women’s rights activism, showing how everyday life, political and intellectual lives have development since the US-led invasion. In addition to this, Ali offers detailed historical research of social, economic and political contexts since the formation of the Iraqi state in the 1920s. 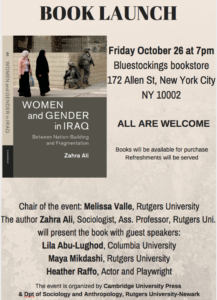 Through a transnational and postcolonial feminist approach, this book also considers the ways in which gender norms and practices, Iraqi feminist discourses, and activisms are shaped and developed through state politics, competing nationalisms, religious, tribal and sectarian dynamics, wars, and economic sanctions. The result is a vivid account of the everyday life in today’s Iraq and an exceptional analysis of the future of Iraqi feminisms. Zahra Ali is a sociologist and Assistant Professor at Rutgers University-Newark. Her research explores the dynamics of women and gender, social and political movements in relation to Islam(s), the Middle East, and contexts of war and conflict with a focus on contemporary Iraq. 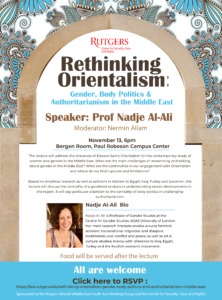 The Rutgers Center for Security, Race and Rights is sponsoring a lunchtime talk on Tuesday, November 13, in the Berson Board Room (Room 292) in the Center for Law and Justice at 123 Washington St. in Newark. 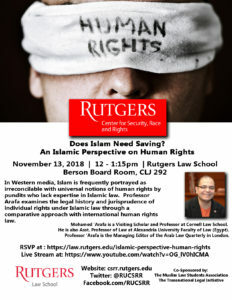 The title of the talk is: Does Islam Need Saving by guest speaker Professor Mohamed Arafa, from Cornell Law School. 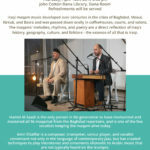 The event is free to attend, but visitors are asked to register at the link Does Islam Need Saving talk.